A new variety of grit, which is designed to stick to the road surface, is being trialled on the M4 near Bristol and Bath. The Highways Agency says that it currently costs £18,000 to treat the entire region to protect against ice. But grit can be easily washed or blown from the road, leaving it unsalted and prone to ice patches. Now the agency will trial a new variety of the substance which has been designed to be more adhesive. 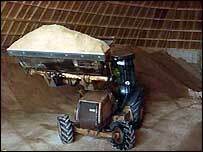 The rock salt will be distributed by lorries from a "grit dome" near Tormarton, South Gloucestershire. Malcolm Wilkinson from the Highways Agency said: "There is nothing wrong with the traditional variety of rock salt, it works very effectively down to low temperatures. "We are happy with the rock salt, but we are just seeing if this development in technology works any better." The Highways Agency adds the new type of grit is less corrosive to cars.